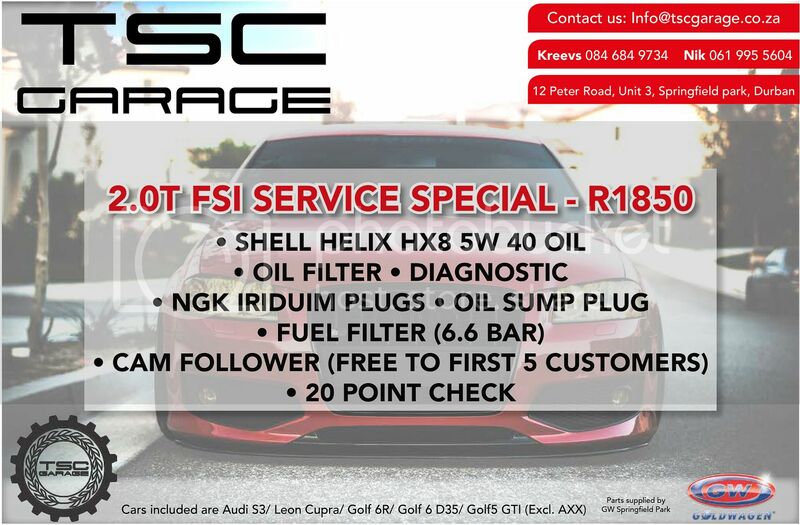 TSC Garage - 2.0 TFSI Full Service Special R1850! TSC Garage is a passionate and premium after-market tuning company who offer high performance software upgrades for Volkswagen, Audi, Seat and Ford models. We also supply and install all supporting hardware from Turbocharger kits to Suspension upgrades. We are launching the Workshop side of TSC Garage with this huge 2.0 TFSI Full Service Special! Please contact us on [email protected] to make your booking! Last edited by kreevs_tsc on Thu Sep 22, 2016 12:13 pm, edited 2 times in total. Re: TSC Garage - TFSI Service Special! Re: TSC Garage - 2.0 TFSI Service Special! Re: TSC Garage - 2.0 TFSI Full Service Special R1850!